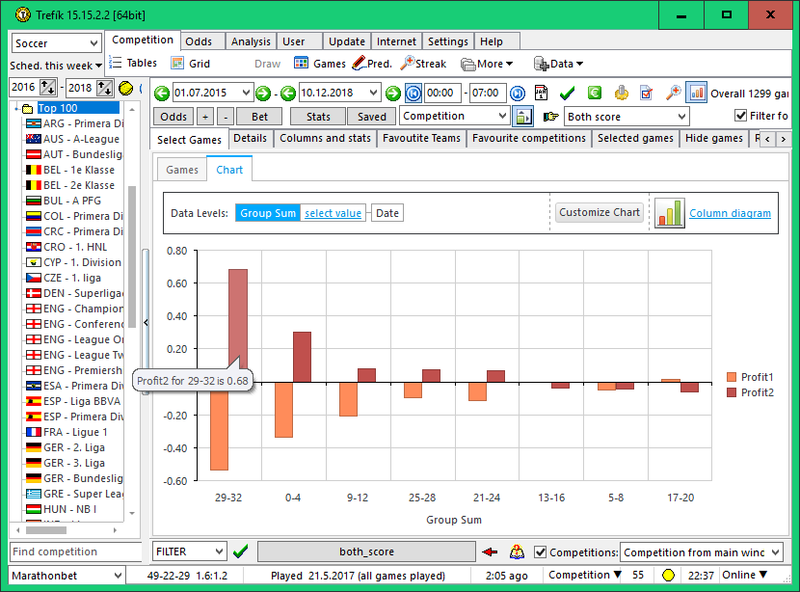 In the following example, we will see how Trefík can analyze the "Both Teams Score" bet. This is a popular bet when it does not matter the outcome of the match, but only the goals scored. And it's up to whether or not the goalkeepers of both teams will be overtaken. We will use a simple filter in the Offer window. 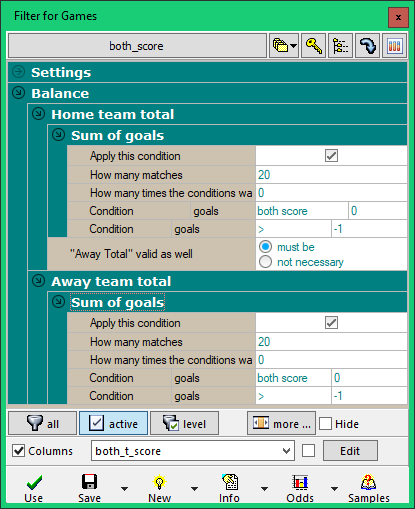 In the Balance section, we select the team (home / guests) and where (total / home / away) to track statistics and activate the Sum of Goals section. 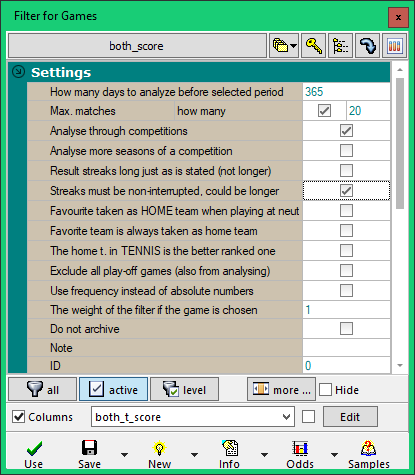 The picture is set to watch the last 20 matches (at the same time it is necessary to specify a period in the Filter / Settings section, which includes at least 20 matches). In the row "How many times the condition has been met", 0 is entered: in this case, all matches will be returned, and in the Offer window we will see how many times the specified situation occurred. In the first line "Condition / Goals" we select the "Both Scored" item - in which case the number of goals is ignored. The second line "Goal Condition" will be left unused (ie, with a value of > -1, which is always satisfied. The second line is used to enter the goal count interval). 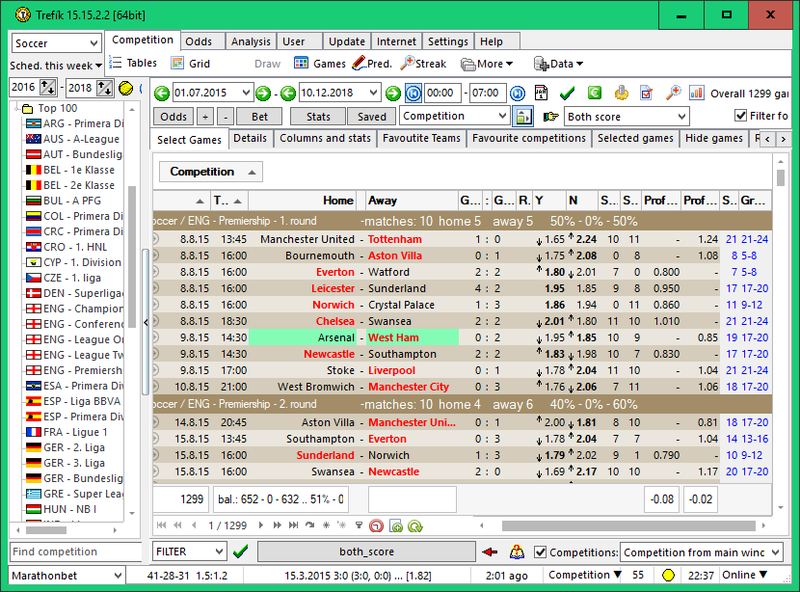 .. activated are the columns "The sum of the goals both gave" for the home total as well as the guests total. This will cause the filters to appear in the Offer window as new columns. .. the value of the new columns in the first line mean: Burnley played in the last 20 matches 10 times the match where both teams scored. Liverpool had such matches just 6. 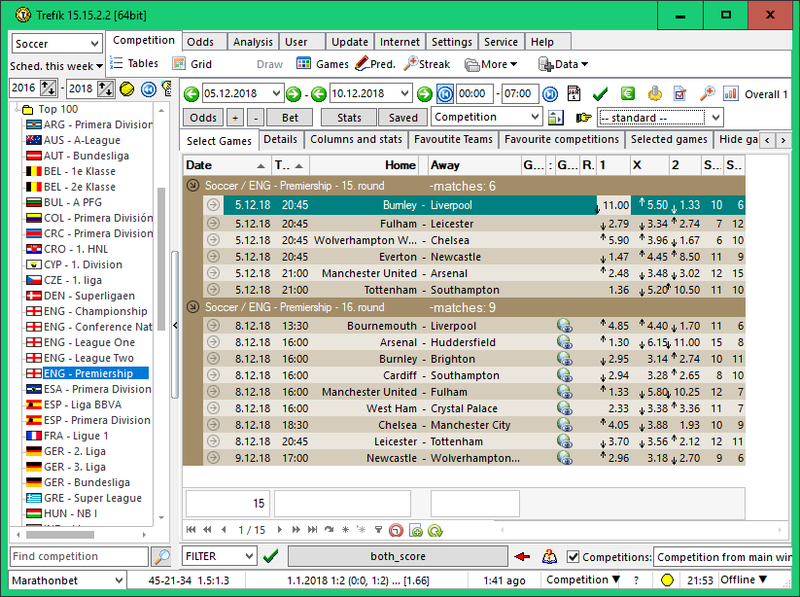 In the previous figure there are odds for the final result (above the list of matches is active the choice of the bet type = STANDARD) We would definitely want that the odds on the bet we are analyzing should be the BOTH TEAMS SCORE (all additional bet types are not covered by Trefik at different bookies). Then also the filter conditions would be using this bet type. But this is undesirable in our case, as the filter is built by evaluating the final result bet. 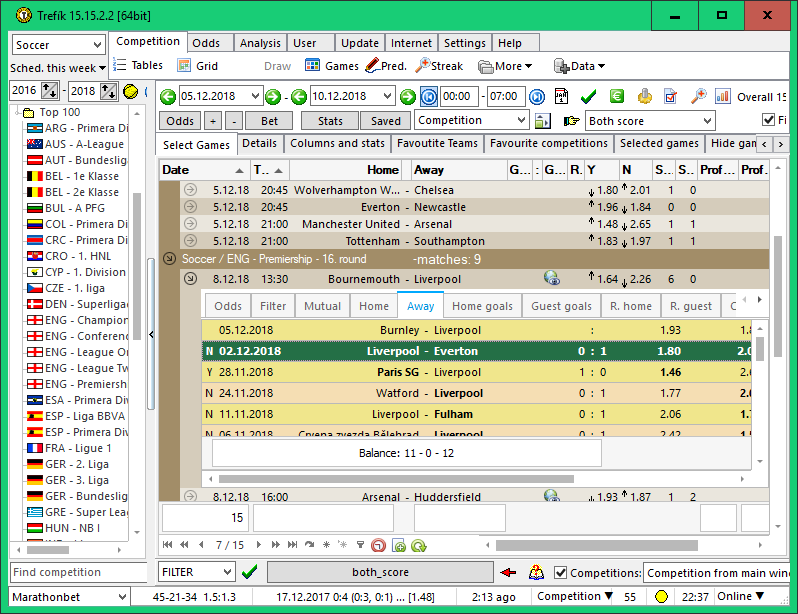 To continue filtering this way, you must activate the "FINAL RESULT FILTER" item to the right of choosing the type of bet (this option would not be active if we wanted to watch the winnings in the first half: then selecting the first half bet filter worked only with results from the first half). 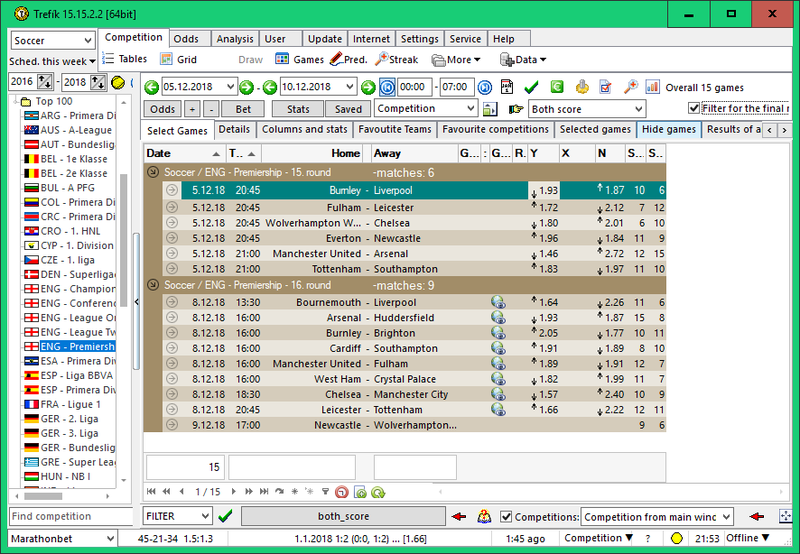 A summary for "Profit 1", ie for a bet that at both team scored is based on -0.02, which is a loss of only two percents of the bet. Apparently, it is worth exploring these bets further. .. we can see here that the bookmaker does not make a mistake in the list of odds, so it is not just about blind bets against "both thems score". The loss is not deep for both preditions but still there is a loss. 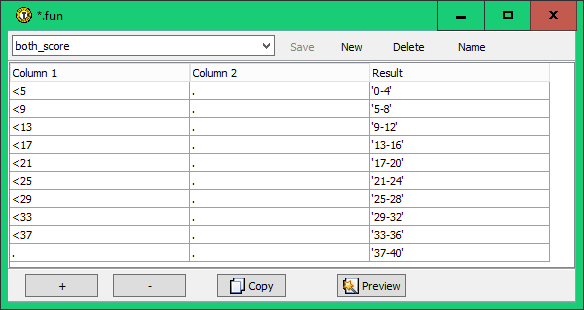 In order to work better with the new column values, it is appropriate to group the matches into intervals according to the values in the new column. To do this, we create another new column using the function "f (s1, s2)"
.. column 1 and column 2 match both inputs to the function. If there is a dot in the definition of the processing, then the value is ignored. The output is divided into four intervals. 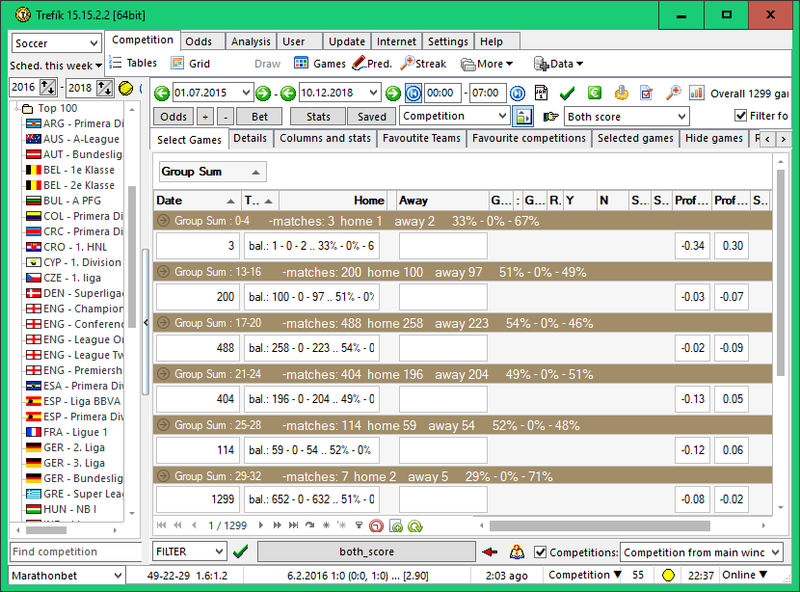 .. at the same time a panel for grouping columns above the list of matches is displayed. You can see this panel using the button next to "Competition" at the top area. .. at the same time, the right mouse button on the grouping panel was pressed, and the "Collapse All" feature was selected. This shows only the headings of each group / interval and its evaluation. .. so we see that some profit is only on tip 2 bets (= at least one team does not score a goal). And the maximum profit is if the value we've watched (the sum of matches for both home and guests when both teams scored for the last 20 matches of both teams) ranges from 29 to 32. We can also check that there are only 7 matches at the selected period meeting that condition. Further exploration of gaining profits is beyond this basic demonstration. For inspiration, we'll show you how to investigate a series of games at the stake, "Both Teams Score". 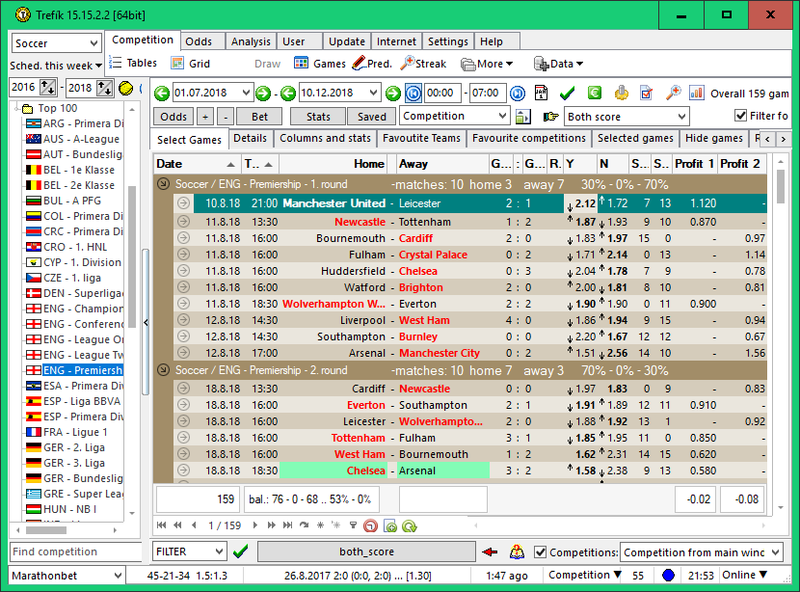 .. the detail results are connected to the selected bet type which is Both Teams Score in this case. The detail match information can be obtained by doubleclick at the match.